Okay, it's not all Green Lake postcards here in our den (aka the guest bedroom). Allie and I also have postcards from other places we've lived in or that mean a lot to us. 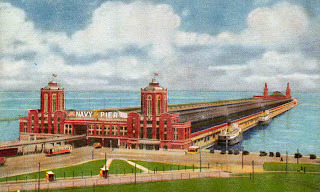 Here's Chicago's Navy Pier, long before it became a hellish tourist trap. Built in 1914 and 1.5 miles long. "Devoted to the docking of lake boats. There are three deck levels for freight and passenger traffic. The outer end contains a concert and dance hall, with a capacity of 4000. Erected at a cost of nearly $4,000,000."